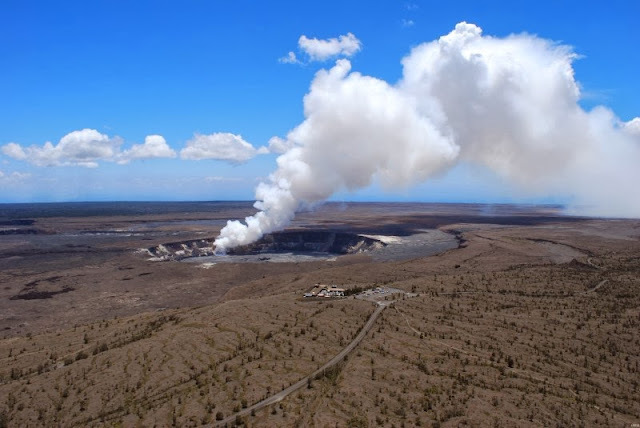 A new study led by scientists at the University of Miami (UM) Rosenstiel School of Marine and Atmospheric Science uncovered a previously unknown magma chamber deep below the most active volcano in the world — Kilauea. This is the first geophysical observation that large magma chambers exist in the deeper parts of the volcano system. Scientists analyzed the seismic waves that travel through the volcano to understand the internal structure of the volcanic system. Using the seismic data, the researchers developed a three-dimensional velocity model of a magma anomaly to determine the size, depth and composition of the lava chamber, which is several kilometers in diameter and located at a depth of 8-11 km (5 — 6.8 miles). The study also showed that the deep chamber is composed of “magma mush,” a mixture of 10-percent magma and 90-percent rock. The crustal magma reservoir below Kilauea is similar to those widely observed beneath volcanoes located at mid-ocean ridges. Scientists are still unraveling the mysteries of the deep internal network of magma chambers and lava tubes of Kilauea, which has been in continuous eruption for more than 30 years and is currently the most active volcano in the world. Note : The above story is based on materials provided by University of Miami Rosenstiel School of Marine & Atmospheric Science. Note: Materials may be edited for content and length.